Adwords advertisers may not be able to track their campaigns using last-click attribution for much longer. For the last year, there have been rumors that Google would like move away from supporting last click attribution at some point in 2018. The company has made several additions to their attribution options in recent years in an attempt to push advertisers away from the popular but often misleading last-click attribution model, and they appear willing to remove it from the system entirely in the near future. While the company does offer a range of different attribution models in their AdWords platform, last-click has been the most popular option among advertisers, despite its flaws. Last-click attribution has been the default model in AdWords accounts for many years, but Google has put a lot of effort into developing new, more accurate, models of conversion attribution as conversion paths become increasingly complicated for many advertisers. Recent rumors have stated that Google is looking to move toward making their data-driven attribution model the Adwords’ account default. If that happens, advertisers will have to keep a close eye on their attribution settings and opt-in to other models that better fit their marketing objectives. While the company has yet to confirm that they will be removing last-click attribution in favor of their data-driven model, the writing does seem to be on the wall. To understand the potential impact of this decision, let’s examine the current attribution models available to Adwords’ advertisers. What is an attribution model? Attribution models allow advertisers to tailor which marketing assets receive credits for conversions to their specific goals and objectives. Remember, choosing an attribution model doesn’t alter the performance of an account, just the advertiser’s perception of it. The goal is to choose the model that best represents your conversion path and provides the most accurate overview of your data. You can change attribution models as you wish, and see what each attribution model has to say about your data without altering the reporting within your AdWords account. Google Adwords currently offers five different attribution models that advertisers can choose from. Each provides its own benefits and drawbacks. As we examine the different attribution models, consider which one might be the best choice for your company should last-click attribution be removed from the platform, as it is rumored to be later this year. In the linear attribution model, every touch point that a customer interacts with on the way to conversion receives equal attribution for the final conversion. The first click that a customer makes receives the same credit as the last click that they make. The linear model is a useful tool for companies that want to ensure that they have a complete picture of the conversion path of their customer and that all of their marketing materials receive equal credit for the conversion. The linear attribution model will count all of the keywords that a customer interacts with throughout the conversion process. For many companies, the linear model may be a solid choice for replacing last-click attribution. While it does assign credit to more touchpoints in the customer’s journey and is not appropriate for all campaigns, it is a safe choice that ensures that all touchpoints are taken into account. The time decay attribution model favors touchpoints that are closest in time to the conversion. They receive the most credit, compared to the first materials that a customer might interact with on the path to conversion, which receive little credit by comparison. The keywords that customers searched and interacted with in the hours leading up to the conversion would receive the most credit. 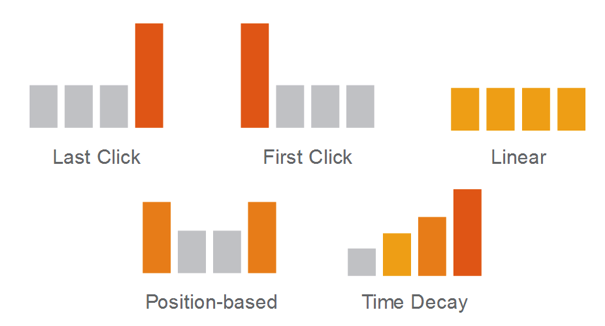 The time decay model is considered to be the closest to the last-click model and would represent the most conservative change in default attribution models within Adwords. It’s an excellent choice for companies that are currently using the last-click attribution model but want to prepare for its rumored removal. The position-based attribution model gives the most credit for conversion to the first and last touchpoints prior to conversion. The keywords that customers first search and last search before converting are each given a 40 percent share of the credit, while the middle touchpoints split the remaining 20 percent of the attribution credit. The position-based model is a unique one that is only applicable in very specific situations. Since a lot of the attribution credit goes to the last click in this model, it isn’t too far removed from the last click attribution model and may be an option that advertisers who are interested in moving away from last click attribution should consider. In the first-click attribution model, all of the credit for the conversion is given to the first touchpoint the customer interacts with. This model generally appeals to companies that are hyper-focused on new user acquisition. An example might be a SaaS company that is interested in introducing their product to new prospects so that they can launch remarketing campaigns. In this example, the “conversion” would be interacting with your marketing materials and having a cookie placed, not a sale of a product. First-click attribution is a very specific model that won’t be a good choice for a majority of Adwords campaigns but does have some specific uses. 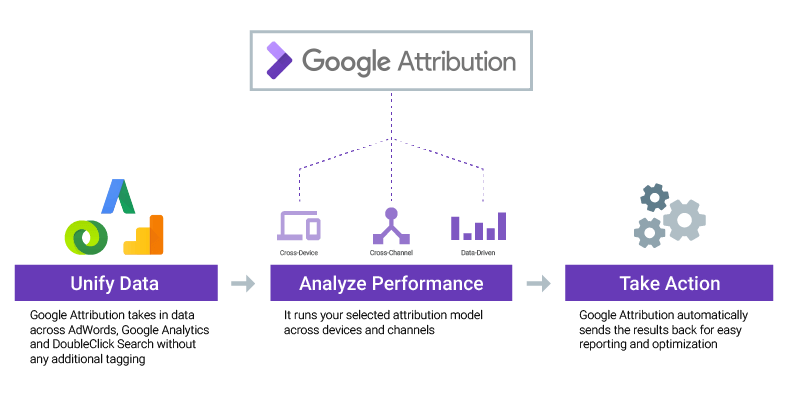 The data-driven attribution model is Google’s preferred attribution model, and one that they have been working to perfect for years. In this model, several different data points are analyzed in an attempt to determine their specific weighting in the conversion process. The credit is redistributed throughout the conversion process, but the model favors the converting ads, keywords, ad groups, and campaigns and assigns them the largest share of the credit. While Google has not yet publicly commented on the potential removal of the last-click attribution model, the most popular attribution model in Adwords due to the fact that it is the account default, they have made their thoughts on the subject clear through their actions. Google favors the data-driven attribution model they have been developing and pushing the last few years. To prepare for these changes in attribution, which could have a profound effect on Adwords campaigns, advertisers should begin researching and testing potential replacements for last-click attributed campaigns. Will China’s preference for digital wallets spread to the West?